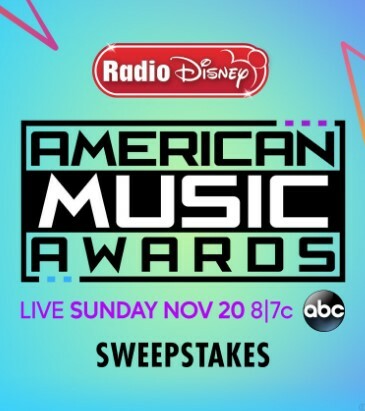 Radio Disney is sending one lucky winner and three of their friends to Los Angeles, California to attend ABC's American Music Awards like a VIP! ONE (1) PRIZE The Sweepstakes Winner will win a three (3) day / two (2) night trip for four (4) people (Sweepstakes Winner, parent / legal guardian, and two other guests) (“Group”) to Los Angeles, CA (“Event City”) to attend the 2016 American Music Awards. This trip consists of the following elements: [a] hotel accommodations for the Group (one standard room, quadruple occupancy) for two (2) nights; [b] if the Sweepstakes Winner resides more than 250 miles from the Event City, round-trip coach air transportation for the Group between an airport near the Sweepstakes Winner’s residence (“Airport of Origin”) and the Event City area airport; and [c] car rental or round-trip car service transfers between the airport and hotel in Event City area. Approximate retail value of the prize (“ARV”): $4,000. HINT: Scroll down about half way to find the spot to enter this sweepstakes! This Sweepstakes ends on 11/10/16 and you can ENTER DAILY to win.